Martin, Peter and Michael co-authored Naseby – June 1645 (Pen & Sword, 2002), a new account and guide to the battle. 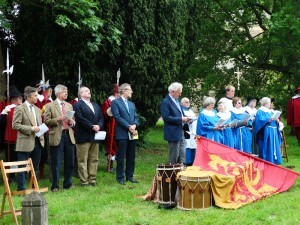 Peter Burton and Martin Marix Evans handed over their tasks as trustees to fresh hands in 2011. 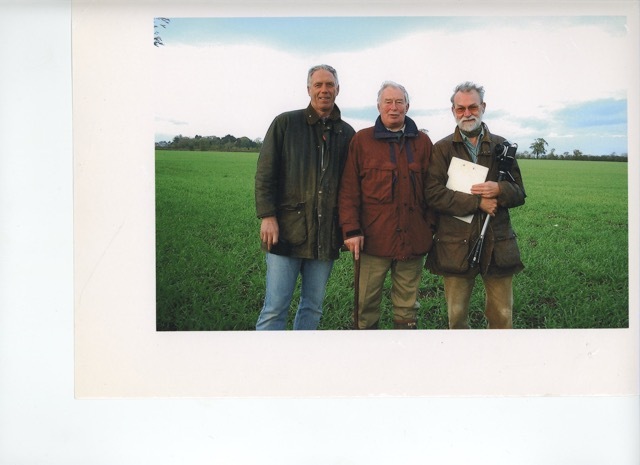 Peter Burton, Michael Westaway and Martin Marix Evans during on-the-ground research for their book on the battle of Naseby. 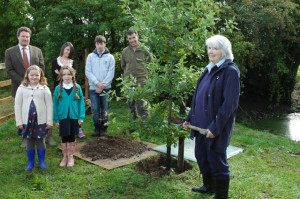 Sally Westaway and her family planting a commemorative oak tree for her late husband in 2010. Michael Westaway died in 2009, and is commemorated at the King’s Oak viewpoint on the Sulby Hedges permissive path. The Feasibility Study has now been completed by Haley Sharpe and will be submitted to the Heritage Lottery Fund by the end of May. We hope the DAC will approve the scheme by the end of June 2017 and once that has happened Haley Sharpe will prepare the first round application to be submitted to HLF by 4th September 2017 for a decision by December 2017. 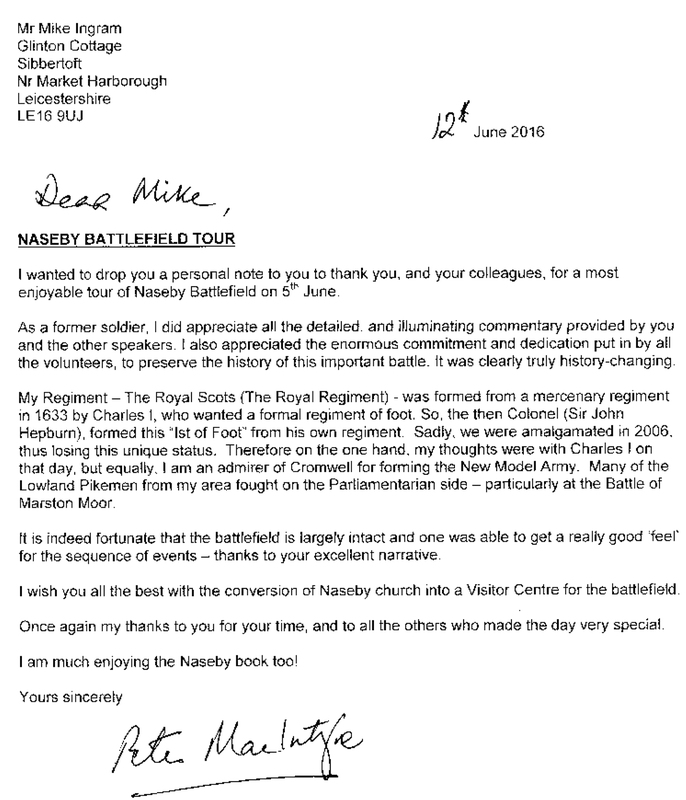 In January 2016 Naseby Battlefield Project received £9,900 from the Heritage Lottery Fund (HLF) for an exciting project, to develop their plans to build a new visitor centre for the Battle of Naseby. 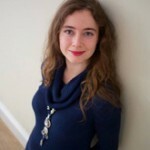 Clare Mulley is a Yorkshire-born poet, shortlisted last year for Young Poet Laureate for London through Spread the Word. 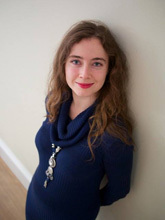 She has since been poet in residence at StAnza Festival 2015 in St Andrews, and had work commissioned by the Tate; her poems have been published by Tower Press, and Forward Press. Next year will see her taking up a year-long school residency in Chelsea, tutoring at the Scottish Creative Writing Centre and embarking on an Arctic expedition to complete an extended work about nature, journeys and global warming. Clare particularly enjoys writing on historical themes, and aims to raise awareness of the work done by the Battlefields Trust through a series of new poems inspired by major sites and commemorative events. the others, standing twenty breaths’ distance. of metal brushing back upon itself, gathered to spring. 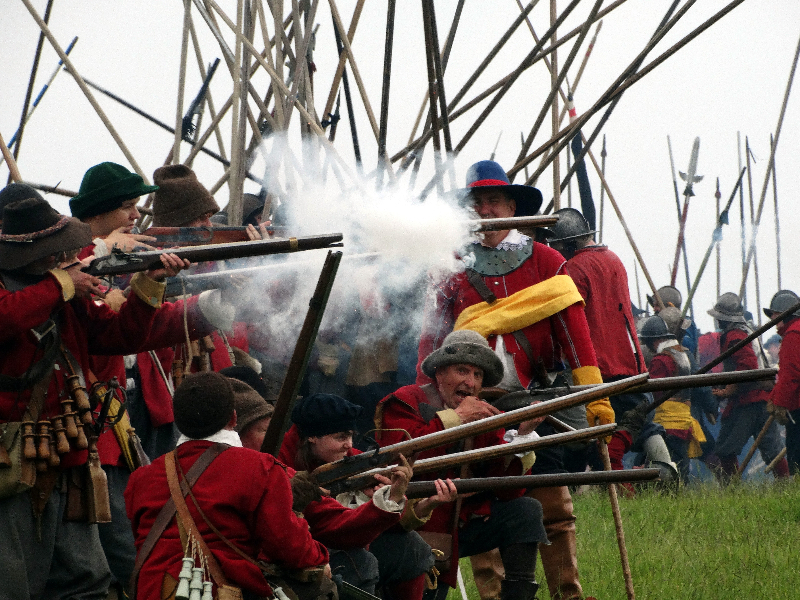 370 years after the Battle of Naseby, on 13 and 14 June 2015, the village of Naseby was full of English Civil War re-enactors to commemorate the battle. 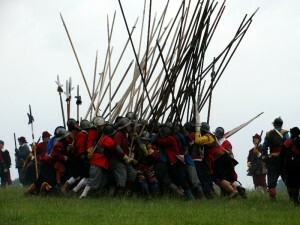 It began on Saturday, despite the rain, with a skirmish in the village. A mini fete was also held in the church. 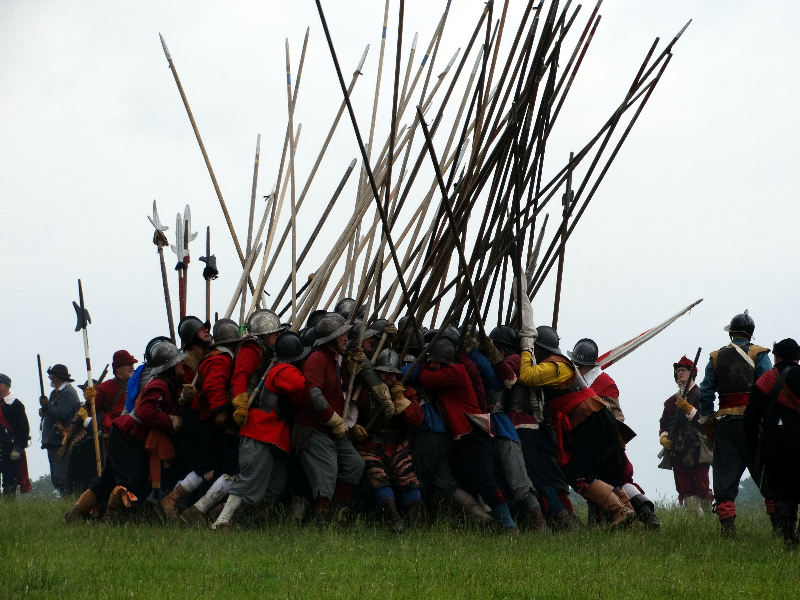 The action then moved to the battlefield where the Sealed Knot re-enacted key moments from the battle, such as the action at Sulby Hedge and the Royalist attack on the Parliamentarian baggage train. Then, in spectacular style, they recreated the battle itself with over 1,500 men and women taking part. For over an hour, the countryside crackled with musket fire and sound of horses’ hooves as they thundered around the battlefield. 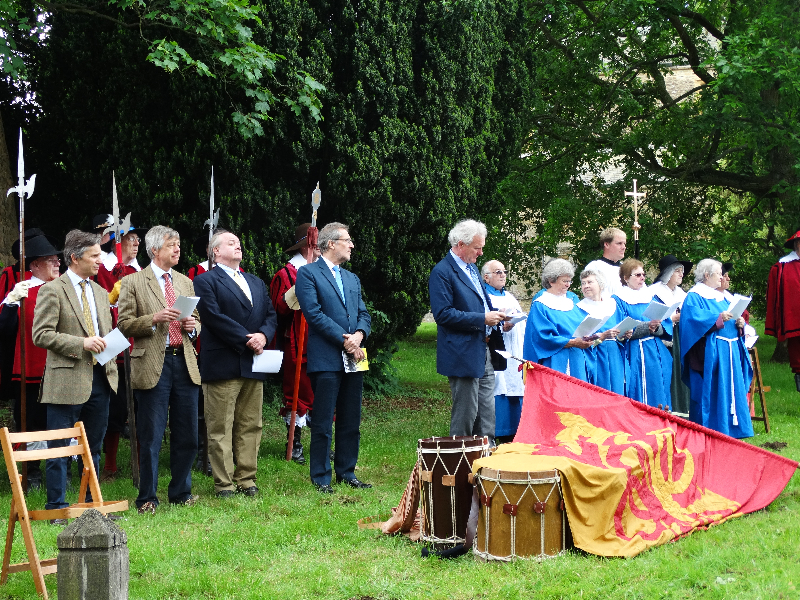 On Sunday morning there was a very moving Drumhead church service outside the village church with the Trustees and Patrons of the Naseby Battlefield Project, the local community and all the Sealed Knot resplendent in their period clothing. This was followed by a very special ‘meet the ancestors’ where the descendants of those who took part met in the church. Then it was back to the battlefield for a repeat of the previous afternoon, although the hundreds of visitors enjoyed better weather. 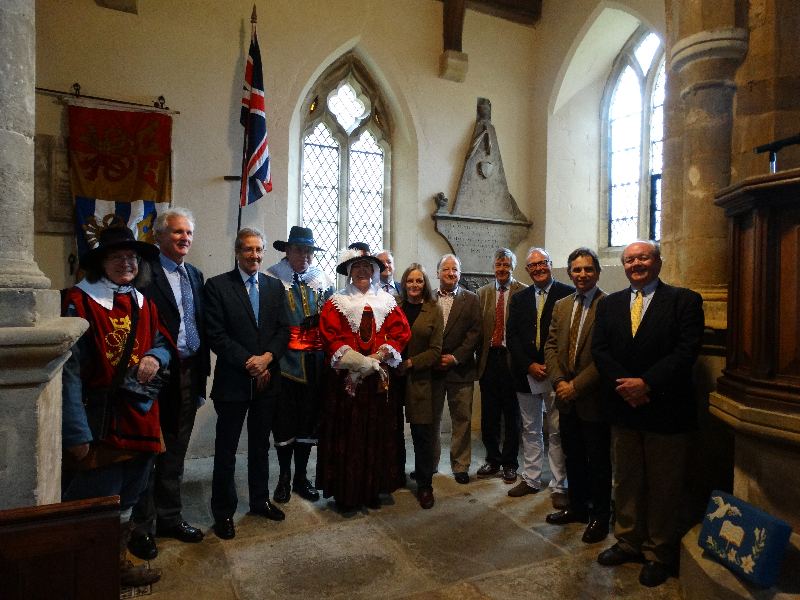 There was even a special Libertea to bring things full circle and commemorate the Magna Carta. 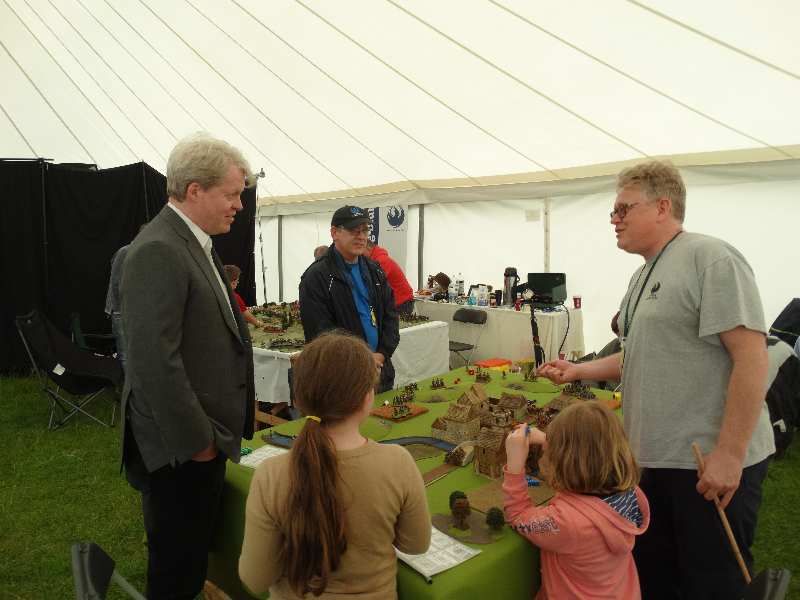 Earl Spencer and a number of the other prominent patrons were there watching the unfolding events and taking an interest in the stands. Lord Hazlerigg was even seen helping out on car parking. A big thank you must go to the Sealed Knot for putting on an amazing show, to those Trustees and volunteers who worked so tirelessly to make the event such a success. It must also go to the Pike and Shot Society, the Northampton Battlefields Society, heritage groups, wargamers, and artists and photographers from across the county as well as our visiting poet Clare Mulley for their support and participation. But the biggest thank you must go to the local community who allowed us to disrupt their weekend. We hope you all enjoyed it. The next Naseby Battlefield Project Patrons meeting will be on Friday 27th March. This meeting will be held at Althorp by kind permission of Earl Spencer. 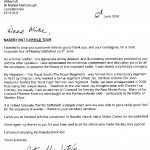 On 1 March, the Hon Hugh Fairfax was appointed a patron of the Naseby Battlefield Project. Hugh Fairfax is descendant of Sir Thomas Fairfax, later 3rd Lord Fairfax, the commander in chief of the New Model Army in the English Civil War and the victor of Naseby. The brother of Nicholas, 14th Lord Fairfax, Hugh is a keen amateur historian and is the author of a soon to be published history of the Fairfax family in America. 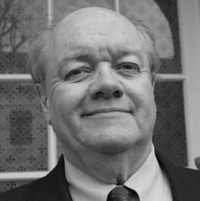 Hugh is an artist by profession and exhibits widely in the UK, France and America. He is married to Victoria and has three children, Alexander, Laura and Marina.